Slither.io has taken mobile by absolute storm the past few weeks and shot to the top of every chart imagineable. Its success was so great, in fact, that a bunch of developers leaped onto the bandwagon, and the App Store is now completely chock full of clones. Now, we’d usually frown on such a thing. But, one of these clones ended up being pretty darn good – the aptly-titledSnake.io. The problem is, it’s not exactly clear which is the better game on first play. We atPocket Gamer want to save you from wasting your time though, and have done the hard work for you. Read on to discover which is the better game. This may come down to personal preference but Slither.io is the most impressive visually, with its glowing orbs, 3D snake models, and those flashy visuals when you go superfast. Snake.io is more appealing to those who prefer a minimalist style. It’s also closer to Agar.io (the game that started it all) with its white-honeycomb background and coloured dots. The snake itself is even made up of a collection of circles, like loads of protagonists(?) of Agar.io. Thanks to its deviation from the trends and relatively flashier visuals, I’d argue that Slither.io clinches it in the aesthetics department. Though there’s still something to be said for Snake.io‘s minimalism. Neither game contains any sound whatsoever. The snake in Slither.io follows your finger or thumb when you hold it down, and you can double-tap to speed up. That comes in handy when you want to ensnare or murder an opposing snake. Snake.io allows you to perform the same actions, but with virtual controls instead. Now, usually we’d say that virtual controls are nasty and should be condemned to mobile hell never to be seen again. But. The controls in Snake.io allow for far greater precision of movement. You can perform loops with the grace of a real snake, and you feel much more in control when you speed in front of an enemy snake to murderise it. This is the clincher – the decider. We can sit here and talk all day about visuals, sound, and controls but, at the end of the day, you’re going to stick with the game that feels the best. Slither.io is the more sedate experience the two. You move slower, have the turning circle of a tank, and have to use your wits more than anything else to gain the upper hand over your opponents. Snake.io is, in comparison, a much faster experience. You can nip around the arena with the speed and grace of an actual snake but this comes at the expense of being killed (and killing) much faster. There’s a greater focus on reactions than wits (though they do come into it) and that’s a good thing, as your movements feel a lot more precise, unlike the sluggish and tank-like feel of Slither.io. You also absorb the orbs as you get close to them in Snake.io, and the scoring system makes a lot more sense. 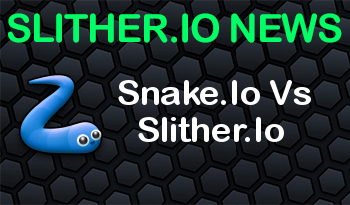 You may prefer the slower pace of Slither.io, but the precise, snappy, and faster feel of Snake.io results in it absolutely dominating in the game feel department. Slither.io is more pleasing to look at, but Snake.io feels and handles a lot nice than Slither.io. As these are the only criteria that matters here (the feature set and longevity are exactly the same) Snake.io absolutely walks away with the competition. There’s more instant satisfaction to be gained, as you can get to the top of the leaderboard in your first couple of games thanks to the nippier gameplay. And, the best part is, it contains the same amount of depth.